Natural Afrodisiac: Transitioning Methods: The results are in! ﻿﻿﻿﻿The results are in from our first poll! The question asked was "What method did you use to transition to natural hair?" It appears that the most popular method of transitioning to natural hair is the big chop method (or, as I call it, the cold turkey method) with 43.8% of respondents. 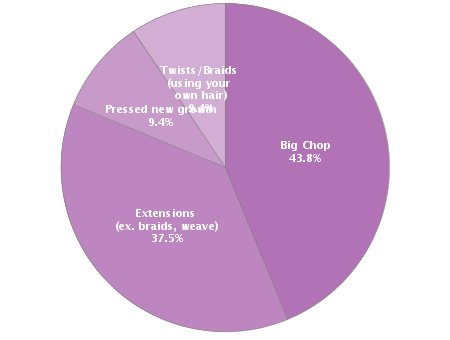 The second most popular is the use of extensions (37.5%) and the least popular transition method was braids or twists without extensions (9.1%). Thank you to everyone who participated and voted! Please look out for and weigh in on future polls.